Personal injury claims for peripheral nerve injuries can run the gamut between mild radiating pain that goes away with some treatment to debilitating conditions that last a lifetime. In the U.S., as many as 20 million people suffer from damage to their peripheral nerves. Two of the most common causes of peripheral nerve injuries are car accidents and falls, but they can happen with other types of accidents and activities as well, including carpal tunnel syndrome from repetitive hand motions, industrial accidents and penetrating traumas. People who have suffered from peripheral nerve damage may face permanent problems, depending on the severity of their injuries. When the injuries happen in accidents that were caused by others, an experienced Los Angeles personal injury attorney may be able to help injured plaintiffs to recover damages to pay for their losses. Motor vehicle accidents account for 46 percent of the cases of peripheral nerve injuries. Motorcycle crashes account for 10 percent of the cases. Pedestrian accidents and gunshots round out the top four causes. The most frequently damaged nerve is the radial nerve that runs down through the arm. It is commonly damaged when a person’s humerus bone is fractured. People may suffer from brachial plexus injuries in motor vehicle crashes. The brachial plexus is a bundle of nerves that originate from the spinal cord in order to innervate the arms, hands and fingers. In many cases, people who have peripheral nerve injuries also have other injuries to their central nervous systems. An estimated 60 percent of people who suffer from peripheral nerve injuries also suffer from traumatic brain injuries. The symptoms that people suffer when they have peripheral nerve injuries will vary, depending on the location of the injury and its severity as well as which type of nerve is damaged. The peripheral nerves send signals to the brain from different areas of the body. The person’s symptoms will depend on whether he or she suffered damage to the motor, sensory or autonomic nerves as well as the degree of injury to the nerves. Motor nerves are responsible for muscle movements, and people who have damage to them may then experience muscle weakness. 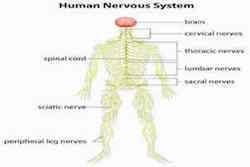 Autonomic nerves control the body’s automatic processes that are involved with breathing, temperature regulation, glandular and heart functions and digestive processes. Sensory nerves communicate information about pain and the feeling of light touches. The degree of neuronal damage is classified as one of five levels. The prognosis for recovery depends on the severity of the level. First-degree peripheral nerve injuries are the most minor injury types. Injuries in this category are characterized by nerve damage that is caused by an interruption of blood flow to the nerve or by damage to the myelin sheath that surrounds it. People who have first-degree peripheral nerve injuries have excellent prognoses and are normally fully recovered within a few weeks to a few months. With these injuries, the coverings of the nerve are intact, but the nerve fibers themselves are damaged. Most people can expect good recovery outcomes that depend on how far away the injury site is from the muscle. In third-degree injuries to the peripheral nerves, the neural axons are disrupted as well as some of the nerve coverings. People who suffer from third-degree injuries generally have poor recoveries because their nerves tend to grow in the wrong directions. Fourth-degree injuries involve axonal disruptions along with more disruptions to the nerve coverings. Unless people have surgery, they will have poor recoveries. Fifth-degree injuries to the peripheral nerves occur when all of the nerve and its covering is damaged. People will have poor recoveries, and surgery may or may not work. A common type of peripheral nerve injury in an accident is an injury to the brachial plexus. This injury may occur in accidents that cause a vehicle occupant’s head and neck to stretch too far. Some people may also have tears to the nerves. Depending on the severity of the injury, some people may suffer permanent disabilities in the affected arm. People who have more minor brachial plexus injuries may experience muscular weakness in the hand and arm from which they may recover over a few weeks. The treatment of peripheral nerve injuries will depend on their severity. For more severe injuries, surgical repair may be indicated. A surgery can be performed either shortly afterward or later. When a sharp nerve laceration has occurred, immediate surgery will be used. If a nerve needs to be grafted, it will happen several weeks after the accident. Nerve reconstruction is performed around three to four weeks after the accident. By this time, the nerve endings will have formed small bundles that will have to be cut out and a graft put in place to connect the ends. Surgeons may wait for several months in order to see if any innervation of the muscles has occurred. Delayed nerve reconstructions are normally used to repair very proximal lesions. Surgeons may also perform tendon transfers. This will require some muscle retraining after the graft is completed. The outcomes following surgery will depend on which nerve is injured and what technique is used to repair it. Some people will be able to recover full function while others will never recover. Many people who have suffered peripheral nerve injuries will also need to undergo rehabilitation. The rehabilitation will focus on improving muscle function while preventing further disability. Passive range-of-motion exercises will likely need to be performed every day in order to prevent nerve contractions. Using the limb early is important to help to prevent further atrophy of the muscles. It may also help to improve the nerve function. Some rehabilitation professionals will use electrical stimulation in order to help to prevent atrophy. Ultrasound may be an alternative treatment to aid in recovery following a peripheral nerve injury. Ultrasound radiation may help nerves to regenerate faster. Splinting is also often performed to help prevent contractions and to help to substitute for the loss of motor function. If you have suffered a peripheral nerve injury in a fall or a motor vehicle accident that was caused by another person, you may need legal help. Contact an experienced personal injury attorney today to schedule your consultation. Our office has over 20 years experience assisting persons who have suffered nerve damage as a result of a motor vehicle accident , slip and fall or many other types of trauma. We can not only assist you with finding a competent Neurologist or other medical specialist to help diagnose and treat these conditions but, we can also determine if a person or persons may be legally liable for these injuries and the physical pain and emotional distress that they cause.